Cut the beef in 1 to 1.5 inch cubes (or bigger or smaller depending how big you like the chunks in your stew) and brown in the lard in a 2-gallon pot. Use small batches and remove each browned batch to a bowl when it’s done; if you dump in all four pounds it won’t brown properly. Brown onions in pot when the beef is done, then put beef back in pot and add water to cover. Slice the ginger as finely as is practical and add to pot. (You can use more or less ginger depending on how spicy you want it.) Add tomato sauce. The soup should be a nice reddish color at this point. 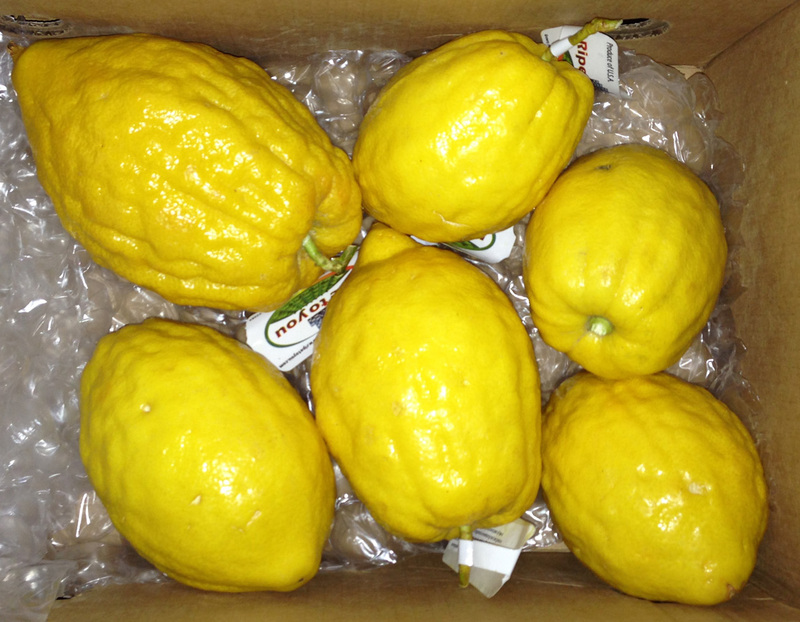 I ordered these from Ripe to You, a farm in California that specializes in exotic citrus. A day later, presto! I have citrons. I’m going to candy the peel, of course, for use in fruitcake (and possibly in chocolates!). Meanwhile, in book-land, I’m almost out of blog posts. If I don’t want to find myself scribbling frantically on Saturday morning, I’d better get to writing. So off to write some more! I made this last night, and it was delicious. Tonight, I added some chili garlic sauce to the leftovers as I reheated it, and it was equally delicious (just spicier!). Thanks!